There are many reasons why somebody cannot manage stairs alone for a time, or permanently. 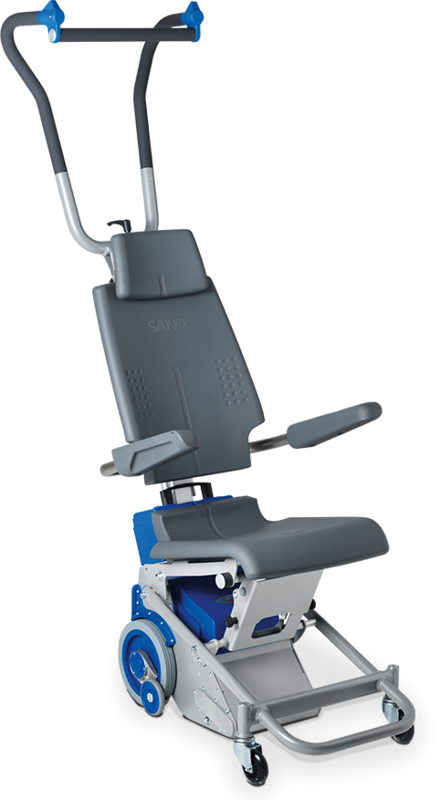 For people who need assistance, Sano offers powered stairclimbers that are easy to use, safe and can be operated without excessive effort. Reliable indoors and outdoors: Basement, ground floor, first floor, garden – with the LIFTKAR PT you can get your whole house back. And there’s more: going to the doctor’s or post office, driving by car to visit friends and relatives, travelling by plane or train, going to the theatre or an exhibition – everything becomes much easier again. A powerful battery pack, mobile charger unit (available as an accessory) and a quick-change battery pack ensure that the LIFTKAR PT is ready for action at any time. Safety and ergonomic handling for indoors. The LIFTKAR PT S features advanced stairclimbing technology and can handle any challenge. The 130 model is designed for people up to 130 kg while the 160 is for people up to 160 kg. The soft upholstered and ergonomically-shaped seat guarantees a comfortable ride. The stairclimber doesn’t start moving down steps until the brake wheels on the lifting mechanism have reached the next step. With this level of safety, the LIFTKAR PT can be manoeuvred relaxed and confidently with an upright posture and without straining your back. The handle unit is easy to adjust and is equipped with anti-slip material. Use the robust crossbar to support and hold the unit. With UP/DOWN switches on both hand grips, the LIFTKAR PT does not need to be adapted when changing between left- and right-handed operators. Choose between three climbing speeds, depending on the nature of the stairs: 10, 14 or 18 steps per minute. The Liftkar PT-S 160 is a perfect daily solution for your mobility problem in a homely environment or a public building. No two buildings are the same and no two situations are the same. Our expert product specialists will provide advice on evacuation concepts for your Organisation. We share the same passion in helping you to make the best choice, when it comes to investing in the right evacuation equipment. So before you order, why not contact us for some expert help!